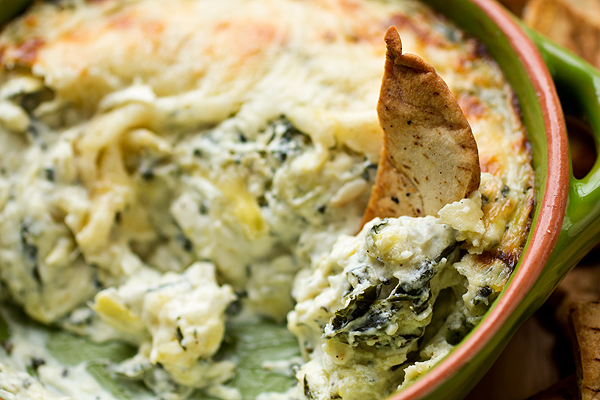 This artichoke dip is rich and cheesy, blended with roasted garlic and kale. It’s a scrumptious treat to pass around and plunge your favorite chips and crisps into! Whenever my hubby Michael and I go out on a little “date night” dinner together, and we’re feeling in the mood to throw all caution to the wind calorically speaking, we’ll usually opt for a hot and bubbly artichoke dip when it’s on the menu. With some crispy tortilla chips or pita crisps served alongside, each bite is wonderfully savory and delicious. Little bits of artichoke, chopped spinach and tons of creamy cheese make it one of our favorites. It’s such a tasty appetizer that I really appreciate being able to whip up my own version in the comfort of my kitchen any time we have a hankering for it. That way, I can even customize it according to our personal tastes. For instance, we’re huge fans of the flavor of roasted garlic; so for my scrumptious artichoke dip recipe, I add in a good amount of mashed roasted garlic cloves. Because we also love a touch of something green and leafy yet a bit hearty, I add in some finely chopped, blanched kale (in place of spinach), which is loaded with extra nutrients. I also like a little touch of tang to balance out the creaminess and the cheese, so I reach for some sour cream along with a hint of mayonnaise for my version, and even a tiny squeeze of lemon. 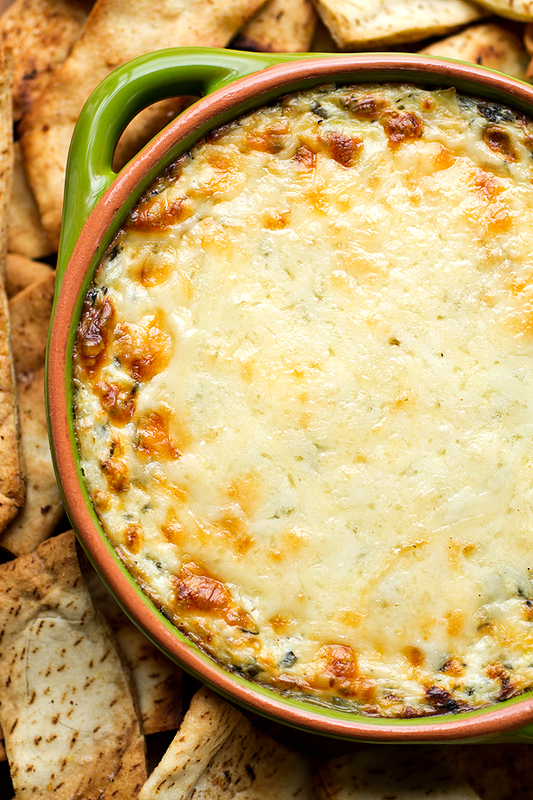 The result is a delicious and decadent dip that’s unlike any other run-of-the-mill artichoke dip, loaded with lots of flavor and perfect to pass around and share! A classic artichoke dip preparation is really nothing more than adding all of the ingredients into a bowl, combining everything until well-blended, and then baking until hot, golden and bubbly. And that’s exactly what my version calls for, only there are a couple of added steps because we’re talking about an ultra flavorful dip here! I begin by roasting my garlic heads (about 40-45 minutes at 400 degrees). While the garlic roasts, I quickly blanch some kale in some salted boiling water for about 30-45 seconds, then shock in an ice bath, dry, and chop. I chop my artichoke hearts and also have those ready. Once the garlic is roasted, I take it out of the oven and allow it to cool enough to handle; then, I squeeze the cloves from the papers and mash them. Finally, I add my other ingredients into a large bowl, fold everything together until well blended, and turn things out into a baking dish. 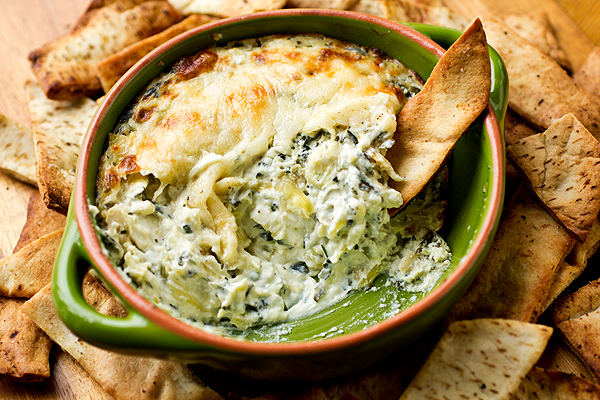 I bake the artichoke dip until hot, bubbly and golden, and serve with chips or crisps! Frozen artichoke hearts for convenience: Using frozen artichoke hearts is a great shortcut. You’ll simply allow them to thaw, and then finely chop them into small pieces. You can also use marinated artichoke hearts (or quarters) for extra flavor, just pat them dry of excess oil/marinade. Getting crazy with the cheese: The flavor combination of provolone, asiago, parmesan and mozzarella is out of this world (I use TJ’s “Quattro Formaggio”), but you can use your favorite variety of cheeses. Other good cheese options are gruyere, jack, pepper jack, or even cheddar—just make sure to look for something meltable. 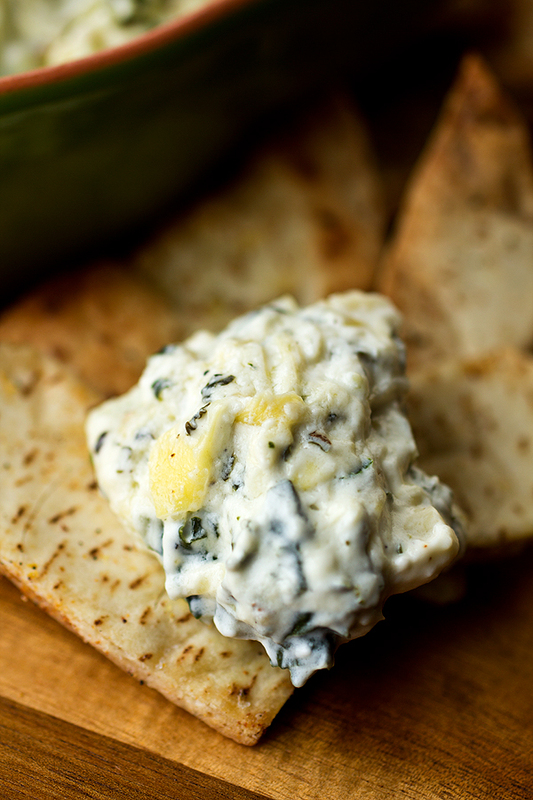 Herb-a-licious: The flavor of fresh parsley is nice and subtle in this artichoke dip, but you can sprinkle in some thyme, or chives, or even green onion. Roasted garlic: Roasted garlic cloves provide a sweet and savory flavor to this dip, and a little hint of earthy-ness; and even though the recipe calls for 2 whole heads, don’t worry! Roasted garlic is far less pungent than fresh, so it will not overpower. I Promise! Prep ahead for an easy artichoke dip: You can very easily prepare this dip so that it’s ready to come to room temp and bake off for your special snacking occasion. Simply prep and then fold all of the ingredients together, add to your baking dish, cover with plastic wrap and refrigerate. Then, remove from fridge a few hours before you want to bake and serve. Hot and bubbly, this artichoke dip is loaded with roasted garlic, chopped kale and five cheeses—it’s the perfect savory and shareable appetizer! -Preheat your oven to 400°, and lightly mist a small/medium-sized baking dish (about a quart size) with cooking spray (this will be for your dip), and set aside for a moment. -To roast the heads of garlic, cut the tops off of each, exposing the cloves; drizzle each head with a little olive oil, wrap each tightly in a small piece of foil, and place directly onto the rack (or onto a small baking sheet) into the oven to roast for 40-45 minutes. -While the garlic is roasting, place a medium-large pot of salted water over high heat; once it comes to the boil, turn the heat off and add the kale in, pushing it down into the water with a pair of tongs; allow the kale to very briefly blanch (about 30-45 seconds). -Drain the kale and immediately plunge it into an ice water bath to shock it and cool it down for a few seconds; drain the kale very well and squeeze out any excess water, and pat dry with a paper towel; next, very finely chop the kale, and remove any bigger, tough “rib” pieces, or chop those up very finely; set the kale aside for a moment. -Once the garlic is roasted and soft, remove from foil and allow the heads to slightly cool so they can be handled; then, squeeze the garlic out of the cloves, and using a fork or the side of your knife, mash the roasted cloves into a paste; set aside for a moment, and turn the oven up to 450°. -Add the softened cream cheese to a medium-large bowl, and to it add the sour cream and the mayonnaise; mix these ingredients well with a spatula, until they are blended and fairly smooth; next, add in the chopped artichoke hearts, the chopped kale and the roasted garlic paste, along with 1/4 cup of the shredded four cheese blend, and mix together. -Add in the parsley, salt, pepper and lemon juice, and incorporate those in, blending the mixture thoroughly. -To bake, turn the mixture out into the prepared baking dish, and smooth the top with a spoon; sprinkle over the remaining 1 cup of shredded four cheese blend, and place into the oven to bake for 20-22 minutes, or until the dip is hot, bubbly and golden on top; serve with /crisps/chips for dipping. Hungry for more hot dips? Check out this Mexican Corn Dip, this Roasted Butternut Squash and Spinach Dip, and this Broccoli and Cheddar Dip! I agree 100%-If you are going to splurge, then eat what you enjoy. 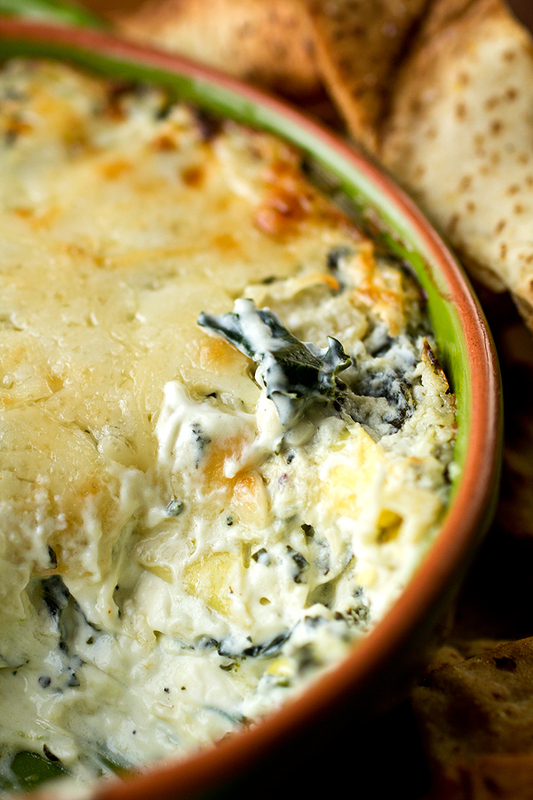 I like this twist using kale on this traditional artichoke dip. Sounds delicious! Thanks very much and have a great day! Love that attitude..eat now, think about it later! 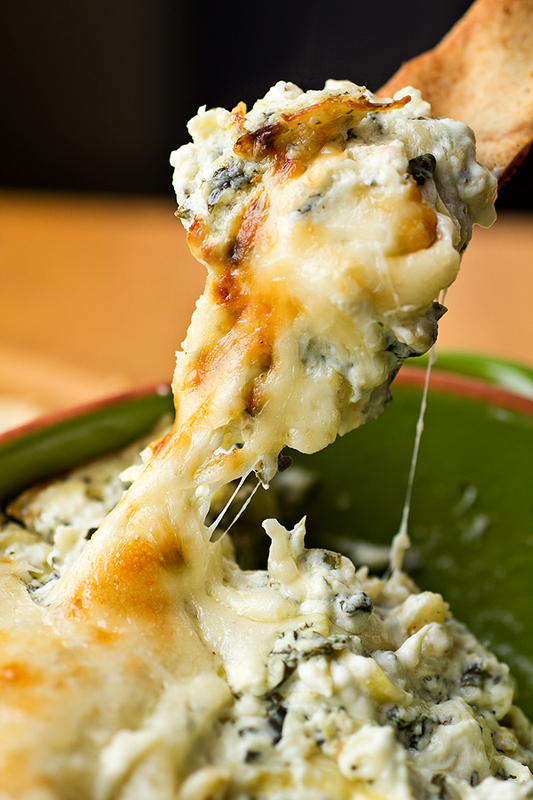 This one is outrageously cheesy and looks extremely delicious. I could eat the whole bowlful! I love the addition of kale in this! I definitely could eat the entire dish in one sitting. Hi Bessie! What’s nice is the kale gives this dip a little extra texture – a bit more than spinach does – so that’s a nice thing when enjoying a hot, creamy dip like this. Thank you for stopping by! Your dip looks so delicious. That’s how I like my vegetables – covered in cheese! This sounds sooooo good! Such a great appetizer!! this looks delicious. I am going to use low fat sour cream, mayo and cream cheese. They don’t taste any different the the regular stuff to me, esp when its all together and baked with cheese. Still a splurge, but not as much and with the same taste! Hi Katie! That’s great – when I’m looking to cut back on the calories, I also like to sub out the lower fat versions; and it still tastes delicious! Hope you enjoy this! Just made this yesterday. Used artichokes in oil (think it might have made it a bit heavy on the artichoke) and wished I had been able to find Fontina. It was a extremely tasty Sunday lunch (and then midnight snack)! I actually had frozen kale courtesy of my mom, and did a quick garlic roast in the microwave—I did mine for a grand total of 4 minutes—the first time I did 6 they burnt horribly. Thanks so much for the recipe! That’s great, Christina! So glad you enjoyed this! Lexi, I’m so excited to read that! 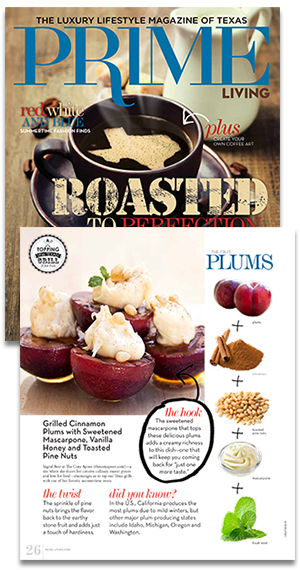 I’m honored to have had one of my recipes prepared for your “ladies night”, and this is the perfect pick. So glad it was enjoyed, and thank you for sharing that with me! 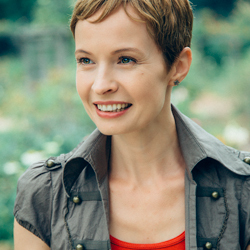 Hi Christina, so glad you enjoyed! Perfect substitutions!